The classes below will help you quickly add different structures to any website. They can be easily overwritten with CSS to customize them on a per site/use basis. The dev team will try to incorporate these into landing page codes where applicable. This code supports 2, 3, and 4 column structures for use on any page. This code is responsive. Change dak-column-2 to 3 or 4 depending on how many columns you need. Duplicate dak-column as many times as needed, they will automatically stack as expected. You can place any content inside the dak-column, images, links, etc. 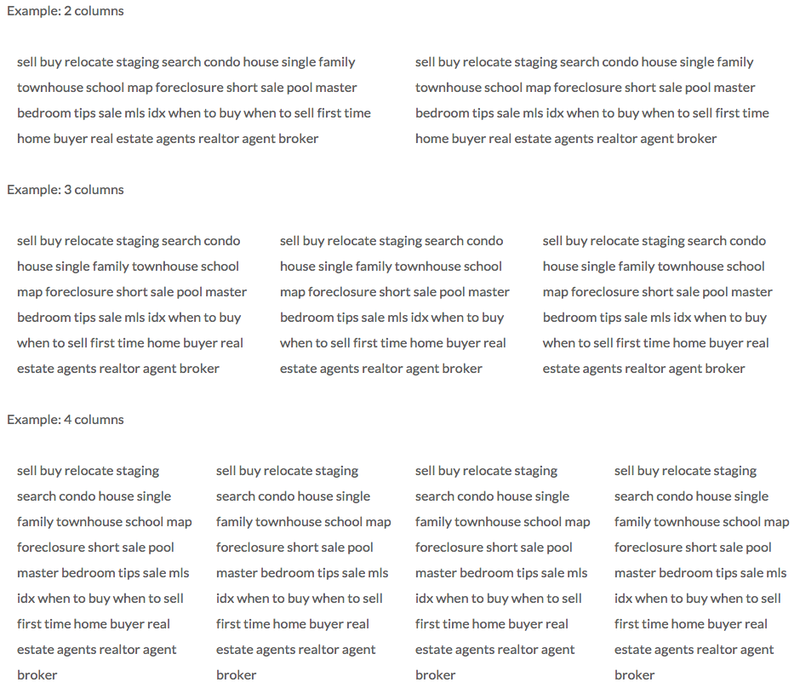 Example of columns with basic real estate 'lorem' text. This code supports 2, 3, and 4 column lists for use on any page. This code is responsive. You can place these classes directly on an ordered or unordered list. List items will display from Left to Right, then wrap to the next row. Change dak-list-2 to 3 or 4 depending on how many columns you need. Floated lists are meant to cinch up space for shorter list items. We have expanded the button classes to allow more flexibility. Because of this, the buttons now have their own article. Learn more about the new buttons.